Before he left for Tulsa, chef Vuong Nguyen made me the finest hollandaise sauce I’d ever eaten. His career in Oklahoma City included training at The Coach House, opening Guernsey Park, completely revamping menus across the metro, and running his all-too-short-lived breakfast and lunch spot Bonjour. He was at Chae, another spot we lost too soon, bringing the brunch menu together when he told me he was leaving to work at The Gathering Place. I said it then and I said it plenty of times since: losing Vuong was a big blow to our city’s culinary scene. Evidence I was right? Take a look at what he’s done since his return. He’s opening Cafe de L’Asie in The Collective, he’s taken an executive chef position at Kwan’s Kitchen (freeing Chef Kwan to focus on dim sum), and he’s now co-owner of Ur/Bun. The dude likes to work and he’s a perfectionist. When he redid the menu at Gigglez, he made me want to eat food at a restaurant called Gigglez. I don’t know if you can understand the enormity of that feat. He’s the kind of chef I trust implicitly. If you need it cooked, Vuong can do it. That trust was only strengthened when I visited Ur/Bun. 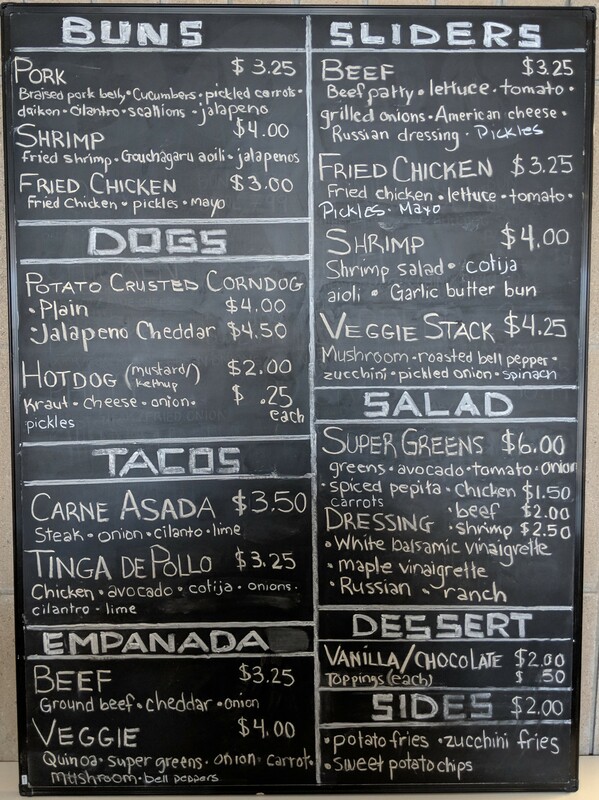 Take a look at this menu. Do you notice how completely insane it is? But this is Vuong. And what he’s doing is putting other restaurants on notice. Protect ya neck! He’s coming in hot. 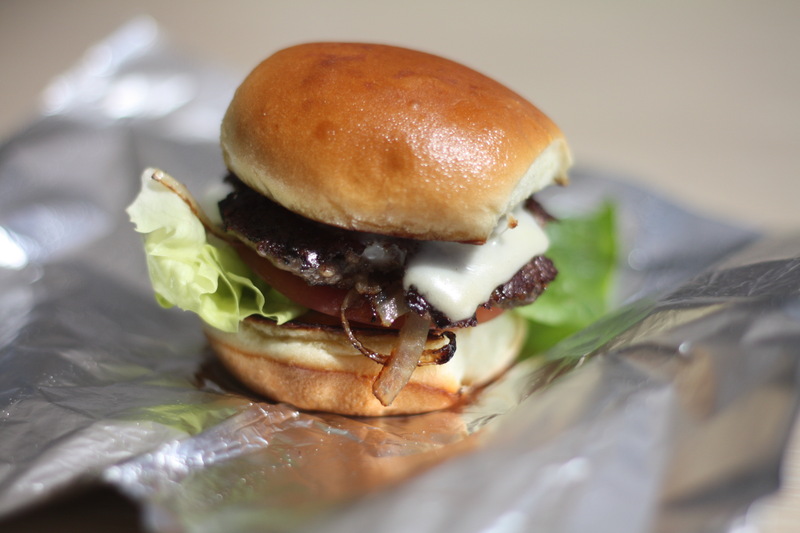 And then you take a bite of this burger, this gorgeous little piece of beautifully charred beef with American cheese melting into it, with grilled onions and lettuce and tomato and pickles and a smear of Russian dressing, and there are no more thoughts. There’s just your mouth and the burger and pure, unbridled joy. 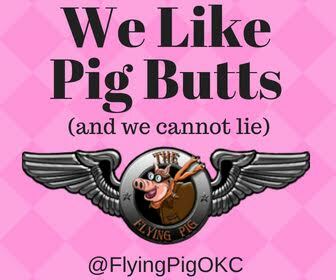 Getting back into a normal headspace after that burger was tough, but Vuong wasn’t through. He brought out the pork bun ($3.25) and I nearly danced. See, back when he was at Guernsey Park, he had this dish that I couldn’t get over: Thit Kho Tau. It’s this Vietnamese pork belly and egg dish and his version was a masterpiece. High-class comfort food all the way. This pork bun doesn’t have his “perfect egg” on it, but it’s still a Thit Kho Tau bun. 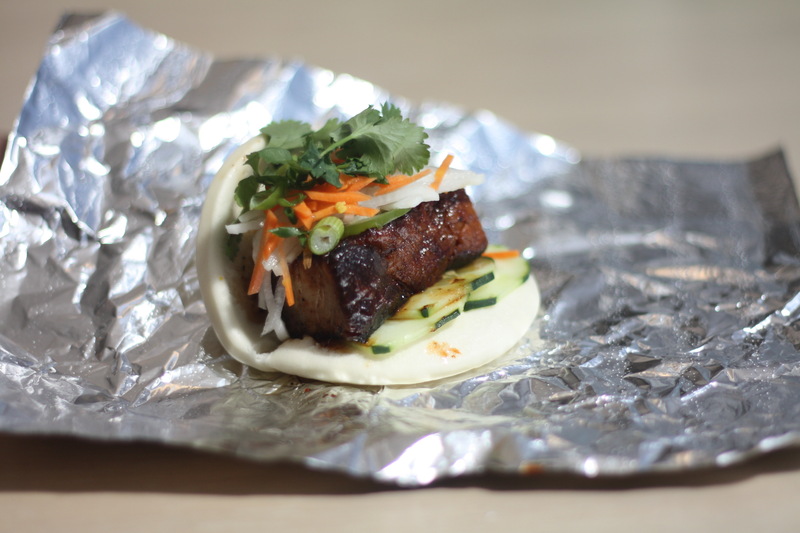 Tender, caramelized pork belly is served in this gorgeous sauce with jalapeno, scallion, cilantro, daikon, cucumbers and pickled carrots, all in one of those slightly sticky chewy pillowy steamed buns. I’m always kind of at risk of dying, what with my generally terribly lifestyle, but this was one of those moments when I was pretty okay with it. If the slider wasn’t fair, then I really don’t know how to explain the weird karma around the carne asada taco ($3.50). 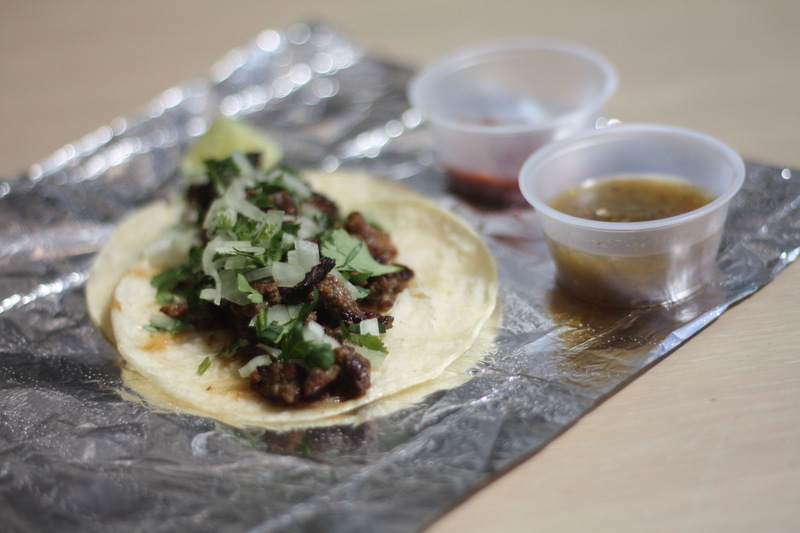 Should a place be able to make amazing burgers, delicious steamed buns AND kill it at tacos? I guess theory doesn’t matter, because I ate it and it was truly a wonderful taco. Vuong has cracked the code. He’s in the Matrix or something and he can make anything taste perfect. It’s bonkers. He’s even made a vegetarian empanada ($4) that any meat-eater would love. Deep fried for that golden crust, these pockets of happiness are full of onions, carrots, mushrooms, bell peppers, greens, and (the big one) quinoa. Yes. There’s butter in the crust, or else it would be vegan, and you couldn’t tell by tasting it. The quinoa and the vegetables hang together in a sauce, almost like a beef picadillo, and the flavor’s not far off from it either. Dunk it in the chimichurri sauce; you won’t regret it. 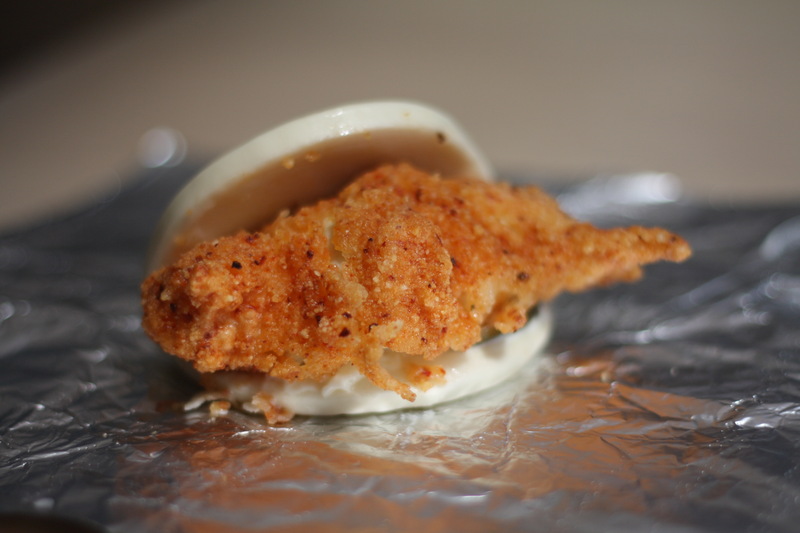 The fried chicken bun ($3) is exactly what you need on Sunday when Chick-Fil-A is closed. And, frankly, it’s a good reason to skip Chick-Fil-A the rest of the time, too. The golden, buttery crisp breading he gets on those juicy pieces of chicken is addictive. Toss in fresh mayo and house-made pickles and you know you’re going to love it. The same goes for the shrimp salad slider ($4), which is about as unexpected as anything else on this rollercoaster of a menu, but it’s hard to argue with the results. The shrimp salad is cool and crisp, with chunks of perfect tender shrimp in a lovely cream sauce, all between a pair of garlic butter-toasted buns. 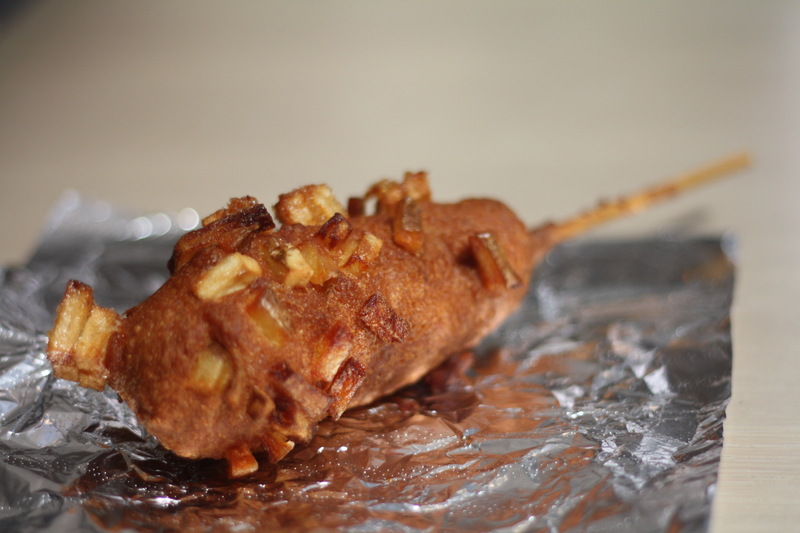 But the one you’re not allowed to miss is the potato-crusted corn dog ($4), even if you only get it for the spectacle. A freshly fried corn dog is a joy to behold (shoutout to The Mighty Corn Dog, who knows this well) and Ur/Bun isn’t doing anything halfway. They’re dunking dogs in fresh batter in the kitchen, and then going one step further. The batter-dipped dog is then rolled in french fries before it’s lowered into a bath of sizzling oil. What emerges is a delicious Frankenstein’s monster of golden-fried potato chunks wrapped around a sweet corn batter and a juicy all-beef dog. Ketchup and mustard are available upon request (I lean toward mustard, but you do you) and I wouldn’t think twice about dipping the dog in that chimichurri sauce, if any of it survived. That’s a flavor sensation right there. 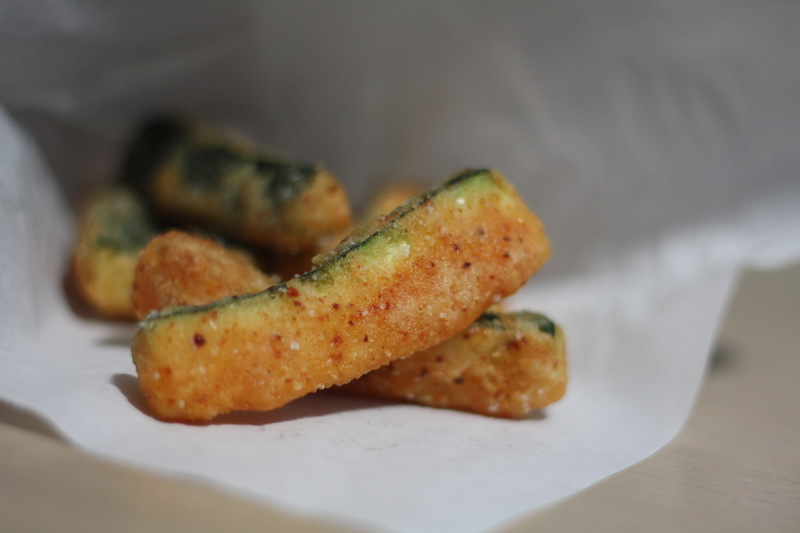 Oh, and I’d be remiss if I didn’t mention the zucchini fries ($2). I don’t know what kind of voodoo he’s got going in that kitchen, but he claims there are only four ingredients to these fries and they are utterly perfect. The zucchini stays tender and slightly crisp, but the outside is transformed with this slightly tacky crunchy crust. The seasoning is out of this world, too. If you haven’t been to Ur/Bun in a minute, I suggest you make plans to go immediately. The sooner they open for lunch, the better; for now it’s dinner only. It’s extremely worth your while.